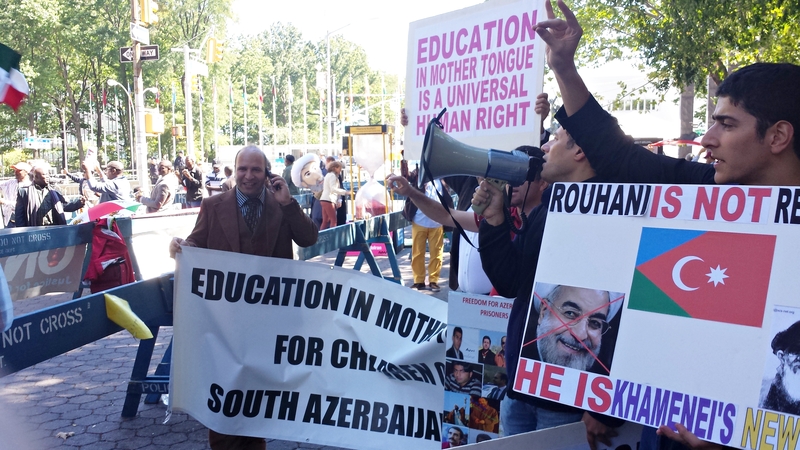 On Tuesday, Sep. 24, 2013, a group of South Azerbaijani human rights activists gathered in front of the UN headquarters in New York to protest the new Iranian president Rouhani while he was delivering his first speech at the United Nations General Assembly. ‘Mehr 1’ (September 23) marks the opening of new school year in the country called Iran. In majority parts of the world children all over the countries enjoy studying their mother tongue from kindergarten all the way to getting their masters or Ph.D. 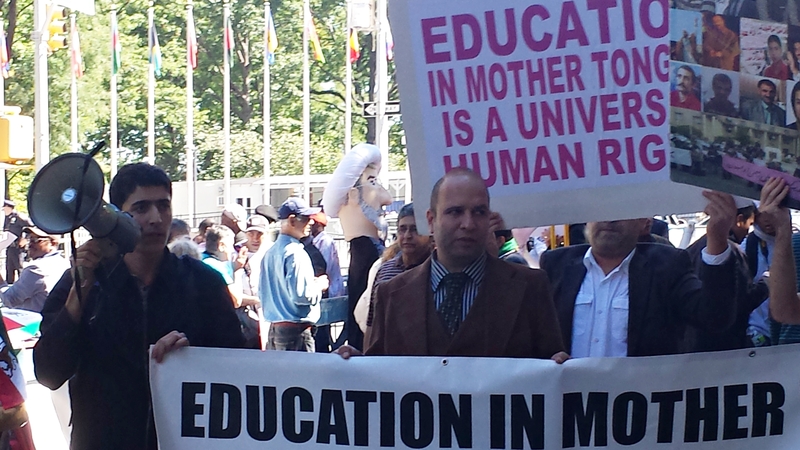 In Iran, however, ethnically non-Persian students are denied their most basic human rights: the right to learn and study ones mother language. Although article fifteen of the Iranian constitution notes that non-Persian languages can be taught in schools and used in the media, all of these promises have been left on paper. 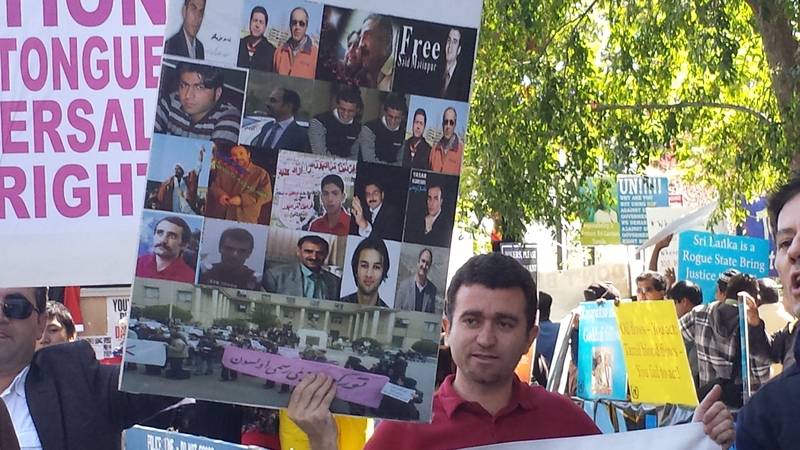 Today, many South Azerbaijani prisoners of conscience are imprisoned by the Iranian regime for their struggle to lift the ban on Azerbaijani Turkish in schools, the media, names of children, store and company names, etc. 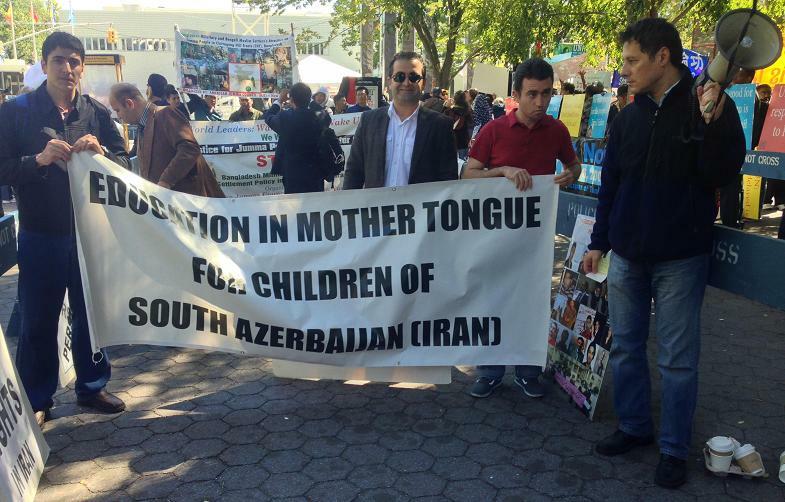 It is unimaginable that in the twenty first century some governments ban certain languages to be spoken in public, to be taught in schools, or for people who speak the language to name their children in their mother tongue; these innocent people are forced to name their kids in names that the government allows, and their stores are being closed for the sole purpose of carrying an Azerbaijani name. 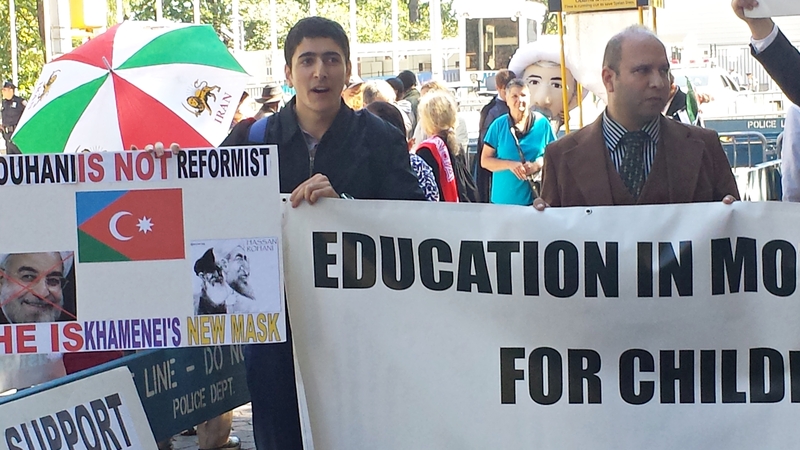 This truly is one of the highest forms of social and cultural racism that the Iranian regime is committing. 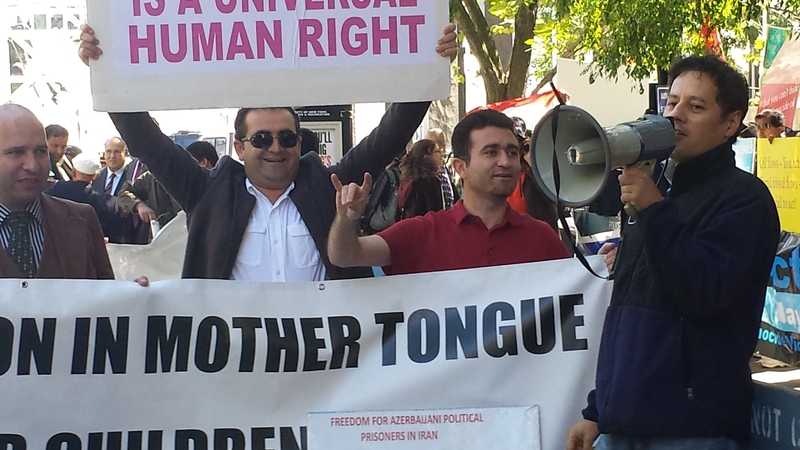 The protestors held signs and recited slogans asking for human rights in Iran, education in mother tongue, end to Persian racism, noting that Iran is not just made up of Persians, that Persian is not the only language in Iran, freedom for South Azerbaijani political prisoners, etc. 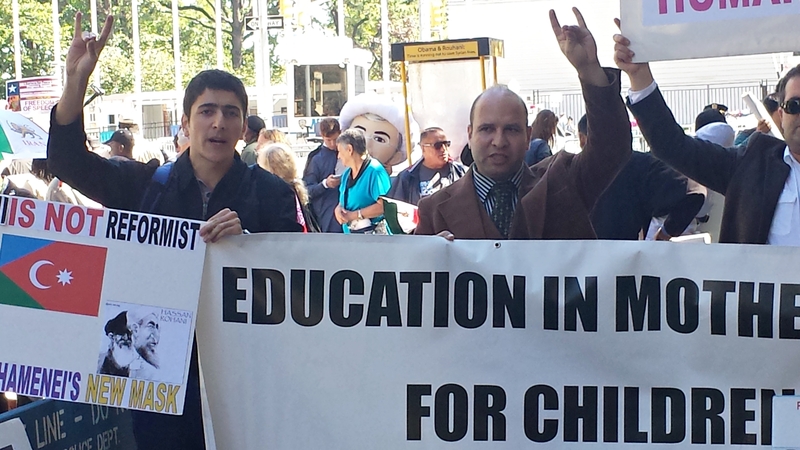 SANAM’s representative, Arsalan Chehrgani also participated in this peaceful protest event. 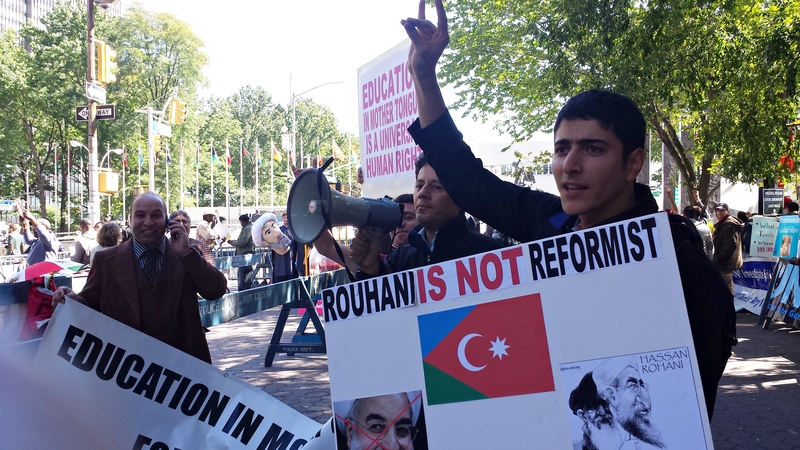 This event has grabbed the attention of world media such as the Voice of America (Azerbaijani section) and others in the Azerbaijani and Turkish press.